Diabetes mellitus is a frequent underlying comorbidity in patients with Staphylococcus aureus endocarditis, and it represents a risk factor for complications and a negative outcome. The pathogenesis of staphylococcal endocardial infections in diabetic hosts has been poorly characterized, and little is known about S. aureus gene expression in endocardial vegetations. We utilized a rat model of experimental S. aureus endocarditis to compare the pathogenesis of staphylococcal infection in diabetic and nondiabetic hosts and to study the global S. aureus transcriptome in endocardial vegetations in vivo. Diabetic rats had higher levels of bacteremia and larger endocardial vegetations than nondiabetic control animals. Microarray analyses revealed that 61 S. aureus genes were upregulated in diabetic rats, and the majority of these bacterial genes were involved in amino acid and carbohydrate metabolism. When bacterial gene expression in vivo (diabetic or nondiabetic endocardial vegetations) was compared to in vitro growth conditions, higher in vivo expression of genes encoding toxins and proteases was observed. Additionally, genes involved in the production of adhesins, capsular polysaccharide, and siderophores, as well as in amino acid and carbohydrate transport and metabolism, were upregulated in endocardial vegetations. To test the contribution of selected upregulated genes to the pathogenesis of staphylococcal endocarditis, isogenic deletion mutants were utilized. A mutant defective in production of the siderophore staphyloferrin B was attenuated in the endocarditis model, whereas the virulence of a surface adhesin (ΔsdrCDE) mutant was similar to that of the parental S. aureus strain. Our results emphasize the relevance of diabetes mellitus as a risk factor for infectious endocarditis and provide a basis for understanding gene expression during staphylococcal infections in vivo. Infective endocarditis is an invasive human disease with an estimated incidence of 5 to 16 cases per 100,000 person-years , and an in-hospital mortality rate of 18% to 20% . Staphylococcus aureus is the most frequent etiologic agent of endocarditis in developed countries , and is associated with an aggressive disease course, a poor outcome, and complications such as local destruction of valve tissue, septic emboli, and persistent bacteremia . Antibiotic resistance is widespread among clinical S. aureus isolates, and bacteremia due to methicillin-resistant S. aureus (MRSA) often requires the use of expensive or less effective antibiotics. Risk factors for endocarditis include injection drug use, prosthetic heart valves, structural heart defects, and comorbidities, such as diabetes ,,. Among patients with endocarditis, S. aureus is more frequently isolated from individuals with diabetes than those with no diabetes . Moreover, patients with diabetes have higher mortality due to S. aureus endocarditis than patients without diabetes . Although defects in the immune response to bacterial infections in patients with diabetes have been postulated , the mechanism(s) behind the increased susceptibility to invasive S. aureus infections remain elusive. Several S. aureus virulence factors have been implicated in the pathogenesis of endocarditis. Fibronectin-binding protein A (FnBPA) and clumping factor A (ClfA) mediate staphylococcal adherence to endothelial cells ,. Damage to cardiac valves results in exposure of the subendothelial matrix and deposition of fibrin and platelets at the site of endovascular injury. ClfA plays a role in S. aureus binding to platelets - an interaction that is critical to the induction of staphylococcal endocarditis . Staphylococci recovered from rabbit endocardial vegetations are highly encapsulated . Other factors shown to play a role in the pathogenesis of endocarditis include gene regulators such as sar and agr, alpha toxin , the sortase enzyme SrtA , and the proline permease PutP . Although numerous studies have described in vivo expression of selected staphylococcal genes ,), few have investigated overall patterns of bacterial gene expression in an infected host. Analyses of global gene expression patterns have focused primarily on in vitro conditions, and few descriptions of the S. aureus transcriptome during the course of an infection have been reported ,. The S. aureus transcriptional profile during growth in broth culture correlates poorly with gene expression in mammalian infections, and further work to characterize S. aureus gene regulation in vivo is necessary . Our goal was to assess the impact of concurrent diabetes mellitus on the course of endocarditis in a well-defined experimental infection model, to compare the transcriptional profile of S. aureus in established endocardial vegetations of diabetic and nondiabetic hosts versus growth in vitro, and to study the role of genes highly expressed in vivo as virulence factors in S. aureus endocarditis. To evaluate differences in endocarditis disease severity and for microarray analyses, diabetic or nondiabetic rats were challenged with the MRSA strain COL. To establish the role of selected genes in the pathogenesis of S. aureus endocarditis, we utilized S. aureus strain Newman and its isogenic mutants. Newman ΔsdrCDE was kindly provided by Dr Timothy Foster, and Newman ΔsbnE was generously provided by Dr David Heinrichs. Staphylococci were cultivated in tryptic soy broth (TSB) to the mid-logarithmic phase, washed in phosphate-buffered saline (PBS), and diluted to yield an inoculum of approximately 3 × 104 CFU/rat. This study was carried out in strict accordance with the recommendations in the Guide for the Care and Use of Laboratory Animals of the National Institutes of Health. All animal experiments were approved by the Harvard Medical School Standing Committee on Animals or by the local authorities in Regensburg. Diabetes was induced one day prior to surgery by injecting male Sprague-Dawley rats (approximately 200 g; Charles River Laboratories, Wilmington, MA, USA, and Sulzfeld, Germany) in the tail vein with streptozotocin (60 mg/kg); control rats received citrate buffer only . Animals were considered diabetic if blood glucose levels exceeded 250 mg/dl after 24 h.
The rat model of catheter-induced S. aureus endocarditis was described previously . Catheterized diabetic or nondiabetic rats were challenged intravenously with approximately 3 × 104 CFU S. aureus 48 h after surgery. Heparinized blood was collected daily from each animal by tail vein puncture and plated quantitatively. Surviving rats were euthanized on day 3 after challenge. Catheter tips (about 2 cm) were removed, sonicated in PBS, and plated quantitatively. The kidneys, spleens, and aortic valve vegetations were weighed, homogenized, and cultured quantitatively. Homogenized vegetations were pelleted, suspended in RNAprotect Bacteria Reagent (Qiagen, Hilden, Germany) overnight at 4°C, and stored at -80°C. Total RNA was prepared from homogenized vegetation pellets from single animals after digestion with 4 mg/ml proteinase K (Qiagen) for 30 min. S. aureus COL cells were lysed with 0.5 ml zirconia silica beads (Fisher Scientific, Waltham, MA, USA) in a dental amalgamator, and RNA was purified with the RNeasy Mini kit (Qiagen), treated with DNase I (Invitrogen, Grand Island, NY), and stored at -80°C. RNA integrity and absence of eukaryotic RNA were confirmed by denaturing gel electrophoresis. RNA from planktonic cultures was isolated from bacteria harvested from mid-logarithmic (5 h) or stationary phase (18 h) TSB cultures incubated at 37°C. Amplification of 10 ng RNA samples using ExpressArt Nanokits (Amsbio, Cambridge, MA) was performed according to the manufacturer's recommendations for bacterial mRNA amplification, except that the final transcription and labeling step was performed using Enzo BioArray HighYield RNA Transcript Labeling kits (Farmingdale, NY, USA) to incorporate biotinylated ribonucleotides into final RNA products. Each biotinylated RNA sample (1 μg) was hybridized to Affymetrix S. aureus GeneChips (Santa Clara, CA, USA) following the manufacturer's recommendations for antisense prokaryotic arrays. GeneChips were washed, stained, and scanned, as previously described . Each condition (diabetic or nondiabetic rat and logarithmic or stationary phase culture) was analyzed in duplicate. GeneChip signal intensity values for each qualifier were then normalized, averaged, and analyzed using GeneSpring 6.2 software (Silicon Genetics, Redwood City, CA, USA), as described . Genes were considered to be induced in a vegetation if they were determined to be present by Affymetrix algorithms in the endocarditis condition, and if they exhibited a greater than two-fold increase in RNA titer (Student's t-test; P ≤0.05) compared to the corresponding planktonic growth condition. Genes were considered downregulated in the vegetations if they were present in either planktonic condition and had an expression level less than 50% of that observed in the corresponding planktonic growth condition (Student's t-test; P ≤0.05). All GeneChip data have been deposited in the National Center for Biotechnology Information (NCBI) Gene Expression Omnibus (GEO) microarray repository under accession number [GEO:GSE62390]. cDNA was synthesized using the AffinityScript Multiple Temperature cDNA Synthesis Kit (Agilent Technologies, Santa Clara, CA, USA), 5 μl of hot-denatured DNA-free RNA, and 100 pmol of random hexamer primers. Products were precipitated in ethanol, resuspended in diethylpyrocarbonate-water, and stored at -20°C. Quantification was performed using a LightCycler 2.0 apparatus (Roche Diagnostics, Mannheim, Germany) and QuantiTect SYBR Green PCR Kits (Qiagen), using 2 μl of cDNA and 20 pmol of each primer. Primers (Additional file 1: Table S1) were synthesized by Eurofins MWG (Ebersberg, Germany). Student's t-tests were used to compare gene expression data. Mann-Whitney U tests were performed to compare quantitative culture data, and the log rank test was used to compare survival distributions. A P-value of ≤0.05 was considered significant. To assess the impact of diabetes on the pathogenesis of S. aureus endocarditis induced by strain COL, we compared the infection in rats with streptozotocin-induced diabetes to that of nondiabetic rats. All rats showed increasing bacteremia levels from days 1 to 3 (Figure 1A). Diabetic rats had significantly higher levels of bacteremia than nondiabetic rats on days 2 and 3 after inoculation (Figure 1A). Diabetic rats had larger endocardial vegetations (Figure 1B) with significantly more bacteria per vegetation (Figure 1C). We also observed trends toward elevated bacterial burdens in kidneys, spleens, and explanted catheters from diabetic rats compared with nondiabetic rats (Figure 1D), although these differences did not reach statistical significance. Endocarditis was more severe in diabetic rats than in nondiabetic rats. (A) Diabetic animals had significantly higher levels of bacteremia on day 2 and day 3 after bacterial challenge. (B) Diabetic animals had larger vegetations, and (C) the vegetations were associated with a significantly higher bacterial burden. (D) The bacterial burden in the kidneys, spleens, and catheters were not significantly different between diabetic and nondiabetic rats. We hypothesized that staphylococcal gene expression might be influenced by hyperglycemia in the diabetic host. Microarray analyses, however, indicated that overall gene expression was similar between the two groups of animals challenged with S. aureus COL. A total of 61 transcripts were more highly expressed under diabetic in vivo conditions (selected genes are presented in Table 1). Most of these genes were associated with metabolic processes such as amino acid and carbohydrate metabolism or cell homeostasis. LightCycler analyses confirmed higher expression of ATP synthase atpA (12.9 ±4.3 fold) and glyceraldehyde dehydrogenase gapA (10.6 ±2.1 fold) in vegetations from diabetic rats compared with nondiabetic rats. Only two genes (SACOL1895 and a 102 bp fragment, both with unknown functions) had significantly lower expression in the vegetations of diabetic compared with nondiabetic animals. Transcription, translation and post-translational mod. To compare S. aureus gene expression in vivo versus in vitro, we isolated bacterial RNA from endocardial vegetations on day 3 post-challenge and from staphylococci in the logarithmic or stationary growth phase. Overall gene expression in diabetic and nondiabetic animals was similar, but differences between in vivo and in vitro growth conditions tended to be more pronounced in vegetations from diabetic hosts (Table 2). Microarray analyses revealed that 116 and 109 genes were more highly expressed in vegetations from nondiabetic and diabetic rats, respectively, compared with both planktonic conditions; 98 and 103 genes were more highly expressed in vivo compared with logarithmic phase cultures only; and 81 and 65 genes were more highly expressed in vivo compared with stationary phase cultures only. Additionally, we observed that 223 and 152 genes had reduced expression under in vivo conditions in nondiabetic and diabetic animals, respectively, compared with both planktonic conditions; 208 and 199 genes had lower expression in vivo compared to logarithmic phase cultures only; and 183 and 106 genes had lower expression in vivo compared to stationary phase cultures only. The largest group of genes differentially expressed in vegetations was genes of unknown function (hypothetical proteins). The next largest groups were genes involved in transcription, translation, and posttranslational modification; amino acid transport and metabolism; cell wall and membrane biogenesis; nucleotide metabolism and replication; carbohydrate transport and metabolism; and virulence or immune-evasion mechanisms (Figure 2). Numerous virulence-associated genes, such as toxins and proteases, were more highly expressed in endocardial vegetations than in planktonic cultures. Number of genes differentially expressed in endocardial vegetations from (A) nondiabetic and (B) diabetic rats. Absolute number of genes down- (left) or upregulated (right) in endocardial vegetations compared with in vitro exponential (red bars), stationary (blue bars), or both growth phases (black bars). The four groups with the highest number of genes more highly expressed in vivo were amino acid transport and metabolism; carbohydrate transport and metabolism; virulence or immune evasion; and transcription, translation, and posttranslational modification. 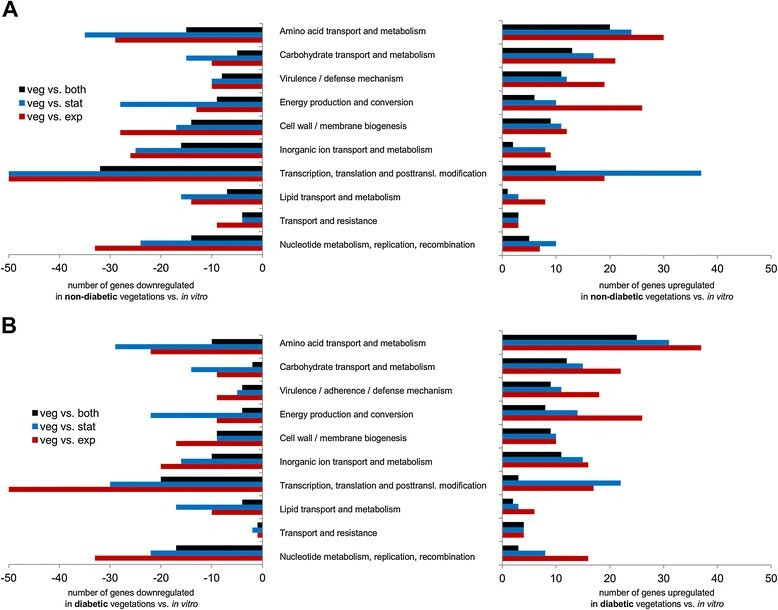 A selection of S. aureus genes differentially expressed in endocardial vegetations compared to planktonic growth conditions in vitro is presented in Table 2. Among the virulence-associated upregulated genes were the alpha-, delta-, and gamma-hemolysins and the bi-component leukocidins LukS and LukF, which were more highly expressed under in vivo conditions than in vitro conditions. Likewise, genes encoding the metalloprotease aureolysin, the serine proteases SplBCDE, and the staphylococcal secretory antigen SsaA were all upregulated in vivo. Staphylococcal enterotoxin B (seb) showed higher expression in vegetations and in stationary growth phase compared with S. aureus in logarithmic growth phase. Neither srtA (encoding sortase A) nor putP (proline permease) showed differential expression in vivo. The superoxide dismutase sodA was significantly downregulated in endocardial vegetations compared with both in vitro conditions. The capsule synthesis operon (cap5A to cap5J) was more highly expressed in vegetations than in either planktonic growth phases, whereas the dltABCD operon (encoding enzymes mediating D-alanylation of teichoic acids in the cell envelope) was downregulated in vivo compared with in vitro. Regarding the S. aureus ica locus that encodes poly-N-acetyl glucosamine, apparently COL does not synthesize this surface-associated polymer since it has a mutated icaC gene (SACOL2692). Most of the other ica genes were not differentially expressed in vivo and in vitro. Among the staphylococcal surface proteins, clumping factor A (ClfA) and B (ClfB) genes were more highly expressed in vivo compared with logarithmic- or stationary growth-phase planktonic cultures, respectively. Fibronectin-binding protein A was significantly upregulated in the vegetations of nondiabetic rats. Genes encoding the LPXTG-anchored proteins SdrC (a beta-neurexin-binding protein) and SasF (associated with resistance to linoleic acid) were upregulated in vivo compared with both in vitro conditions. Of note, expression of both spa (encoding protein A) and pls (encoding a surface-associated plasmin-sensitive protein) were significantly lower in vivo than in vitro. Regarding iron acquisition, we observed high in vivo expression of the sbn operon-encoding proteins required for the synthesis of the nonhydroxamate siderophore staphyloferrin B. SbnABDEGHI were significantly upregulated in vegetations from diabetic animals compared with logarithmic and stationary phase planktonic cultures. The same trend and magnitude of changes in expression were also observed in nondiabetic vegetations, but were not considered statistically significant. In addition, sirB, part of the sirABC operon encoding transport of staphyloferrin B into the bacterial cell ,, showed significant upregulation in nondiabetic rats with endocarditis. Some of the genes encoding the siderophore staphyloferrin A (SACOL2167, SACOL2169, and SACOL2170 ) were upregulated in endocardial vegetations (Table 2). Several of the iron-regulated S. aureus genes were also involved in transport. Among the Isd genes that mediate heme uptake, only isdD (a heme ABC transporter) was consistently upregulated in vivo and only versus logarithmic phase S. aureus. Other iron-regulated genes with significantly higher expression in vivo included the oligopeptide permease and norD genes of the opp1ABCDFnorD operon . Numerous genes encoding transporters were highly expressed by S. aureus in endocardial vegetations. 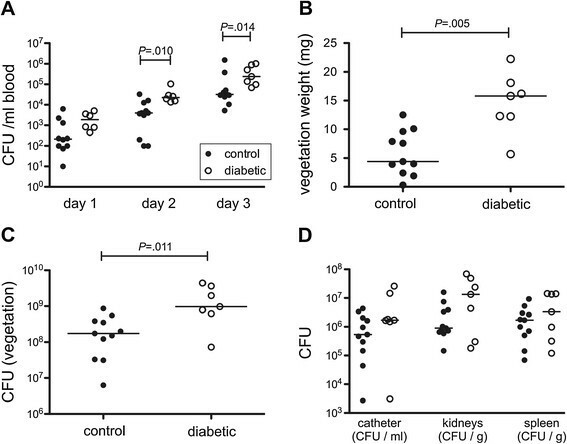 The maltose transport (malEFK) genes were almost uniformly upregulated in vivo by staphylococci recovered from infected vegetations of nondiabetic and diabetic rats. Similarly, kdpAB genes encoding a potassium-transporting ATPase were upregulated in diabetic vegetations compared to both in vitro growth conditions. Other upregulated transporters include epiGEF, involved in lantibiotic transport, and tet38 and norB, mediating drug resistance. Of note, mntH (a Mn2+/Fe2+ transporter) was downregulated in vivo compared with both planktonic conditions, whereas the mntABC operon (involved in Mn2+ uptake ) was upregulated compared with logarithmic phase S. aureus and downregulated compared with stationary phase cells. A large uncharacterized transporter operon (SACOL2471-2479) was upregulated in vivo, whereas the SACOL0157 to SACOL0160 operon had significantly lower expression levels in vegetations than in planktonic cultures. Genes associated with metabolic pathways and more highly expressed in vegetations were numerous and included an alcohol dehydrogenase (adhE), nitrite reductase (nirBD), and genes implicated in arginine (argGH and two arc operons) and pyruvate (pflAB) metabolism. Transcription of a few staphylococcal regulatory genes was enhanced in vivo. The transcriptional regulator GntR showed higher expression in vivo in nondiabetic rats. By contrast, genes encoding the staphylococcal accessory regulator SarS, the iron-regulated repressor Fur, the regulators VraR and VraS, and the transcriptional regulator AraC had lower expression in vivo than in vitro (Table 2). The agr locus did not show consistent changes in vivo and in vitro (Table 2), although in diabetic rats the locus was upregulated compared with in vitro logarithmic phase cultures. We used quantitative PCR to confirm differential expression of selected genes in vivo. Genes were selected based on upregulation in microarray analysis, being a potential virulence factor, and not having been implicated in the pathogenesis of endocarditis previously. In vitro or in vivo expression of sbnC, sdrC, and splB was thus quantified using the LightCycler real-time PCR system. Although the magnitude of the differences in gene expression varied, we observed an overall good correlation between gene expression measured by microarray and LightCycler. All three genes tested showed a trend towards higher gene expression levels in vivo, but only splB showed significantly higher gene expression in endocardial vegetations compared with both planktonic growth phases (60.4-fold upregulation versus logarithmic growth phase, P <0.01; and 8.6-fold versus stationary growth phase, P = 0.03). Expression levels of sbnC and sdrC in endocardial vegetations were significantly higher compared with logarithmic growth phase S. aureus (502.3-fold for sbnC, P <0.01; and 25.1-fold for sdrC, P <0.01). To assess the contribution of selected genes preferentially expressed in vivo to the pathogenesis of S. aureus endocarditis, we performed virulence studies in the nondiabetic rat endocarditis model. We chose genes that had not previously been implicated as important in endocarditis - the sbn locus (encoding staphyloferrin B) and the sdrCDE locus (involved in fibrinogen-mediated S. aureus adherence to platelets under in vitro shear flow conditions ). Rats infected with Newman ΔsbnE survived longer than rats infected with the parental isolate (Figure 3A; P = 0.047, log-rank analysis), and they had lower bacteremia levels at all time points, although the differences reached significance only on day 2 (P = 0.039; Figure 3B). Likewise, rats infected with strain Newman experienced greater weight loss (P = 0.002) than rats infected with the sbnE mutant (Figure 3C). No significant differences were observed in the bacterial burden in kidneys (Figure 3D) or vegetations (Figure 3E) from rats infected with Newman or the ΔsbnE mutant. By contrast, rats infected with strain Newman or the ΔsdrCDE mutant had similar survival times (not shown), bacteremia levels (Additional file 1: Figure S1A), and weight loss (Additional file 1: Figure S1B). Likewise, the bacterial burdens in the kidneys (Additional file 1: Figure S1C) and endocardial vegetations (Additional file 1: Figure S1D) were comparable for wild-type and ΔsdrCDE strains. Comparative virulence of strain Newman and its isogenic sbnE deletion mutant. (A) Compared to rats infected with strain Newman, rats infected with the sbnE mutant (defective in the synthesis of the siderophore staphyloferrin B lived significantly longer than rats infected with the parental strain, (B) had significantly lower levels of bacteremia on day 2, and (C) lost significantly less weight 48 h after bacterial inoculation. (D) Bacterial burdens in the kidneys and (E) vegetations were not significantly different between wild-type and mutant strain. Patients with diabetes have a higher risk of staphylococcal infections than those without diabetes, and patients with diabetes who develop S. aureus infective endocarditis are likely to experience a poor outcome ,. We have demonstrated in an animal model of S. aureus endocarditis that diabetes is associated with a more severe disease course, as reflected by higher levels of bacteremia and larger endocardial vegetations. We used the vegetations recovered from infected rats on infection day 3 to investigate the in vivo transcriptome of S. aureus in the setting of an acute infection. This time point allowed maximal recovery of organisms multiplying within the host and allowed us to recover sufficient bacterial RNA for analysis. Characterization of gene regulation and gene expression under in vivo conditions is a prerequisite for alternative treatment approaches, including the development of new drug targets and vaccination strategies. The S. aureus transcriptome under in vivo conditions has not been well characterized. Global S. aureus gene expression in vitro has been investigated after in vitro exposure to microbicides , in response to mild acid , during growth in biofilm , in blood , and after phagocytosis . Changes in S. aureus gene expression during early adaptation to the mouse lung have been described , and Date et al. recently reported global S. aureus gene expression in human abscesses and infected murine kidneys . Our study is the first description of the S. aureus transcriptome during an established endocardial infection. We used rich medium (TSB) as an in vitro comparator condition, although minimal medium such as Roswell Park Memorial Institute medium may better reflect iron-limited conditions in vivo. The choice of TSB as the in vitro comparator medium may explain some of the differences in gene expression reported (for example, iron-rich medium versus iron-depleted in vivo conditions). However, one of the aims of our study was to compare the gene expression pattern observed in endocarditis vegetations to gene expression found during growth under standard laboratory conditions. Our approach thus ensures comparability to previously published in vitro data (including previous microarray data, for example ,-). It also highlights the important contribution of in vivo conditions (for example, iron starvation) to S. aureus gene expression during an infection. An additional limitation of our study is the lack of a glucose-supplemented in vitro control arm. However, the fact that we did not observe significant differences in S. aureus virulence gene expression between nondiabetic and diabetic rats makes this additional control less important. S. aureus COL is a well-defined and sequenced MRSA strain, which we used for the experiments with diabetic versus nondiabetic rats and the microarray analyses. Moreover, all gene expression studies and subsequent analyses were performed with strain COL. A related methicillin-sensitive S. aureus strain (Newman ) was used for the single gene knockout studies because of the availability of relevant mutant strains. Mutations in strains Newman and COL have been described -, and both strains are members of clonal complex 8 and readily produce endocarditis in rats. We observed that more than 100 genes were upregulated in endocardial vegetations compared with in vitro cultures. However, the number of genes significantly downregulated in vivo was approximately two-fold higher than the number of genes upregulated in vivo. This may be because in vivo S. aureus gene expression was analyzed from vegetations three days after bacterial challenge. Date et al. reported similar gene expression patterns in human abscesses and infected murine kidneys for some S. aureus genes, such as the serine proteases spl, gamma-hemolysin, and the opp1 operon. Other genes with higher expression levels in abscesses, such as the isd genes, however, were not differentially expressed in endocardial vegetations in our study. A majority of the genes that were differentially expressed in endocardial vegetations have not yet been assigned a function or are classified as hypothetical proteins. ClfA is a critical virulence factor in S. aureus endocarditis  and clfA transcript levels have been reported to increase after the late logarithmic growth phase in vitro. In our study, clfA was upregulated in vivo versus logarithmic growth phase cells, whereas fibronectin-binding protein A was found to be significantly upregulated in nondiabetic vegetations only. Both are likely to be critical for initiation of infection, as has been described in previous studies ,. Although acapsular strains provoke endocarditis at lower inocula than encapsulated isolates , S. aureus recovered from vegetations produce large quantities of capsular polysaccharides , consistent with our observation that the cap5 genes were upregulated in established vegetations. Capsule production enhances bacteremia in vivo and renders the bacterium resistant to uptake and killing by neutrophils . Moreover, active and/or passive immunization strategies targeting capsular polysaccharides were able to protect rodents against S. aureus bacteremia  and endocarditis . In contrast to the cap5 genes, the dlt operon was downregulated in endocardial vegetations. The dlt genes encode proteins mediating D-alanylation of lipoteichoic and wall teichoic acids, and transcription of the dlt genes is repressed in the presence of cations such as magnesium salt . Higher dlt expression has been associated with daptomycin resistance , and the observation that dlt is downregulated in endocardial vegetations could thus support clinical and preclinical data on the use of daptomycin in staphylococcal endocarditis ,. Other virulence factors upregulated in vivo include exotoxins (hemolysins and leukotoxins) and proteases. The serine protease genes splA to splE are located on a pathogenicity island , and these proteases play a role in the degradation and inactivation of antibacterial peptides . Both Spl proteases and aureolysin (aur) are associated with detachment of S. aureus from established biofilms  and may promote bacteremia by dispersing staphylococci from endocardial vegetations. Exotoxins upregulated in endocardial vegetations include two-component pore-forming cytolysins such as gamma-hemolysin and LukFS that are able to lyse erythrocytes and leukocytes . Other factors previously implicated in the pathogenesis of endocarditis, such as SrtA  and PutP , were not differentially expressed in endocardial vegetations compared with planktonic conditions. To acquire iron from the host organism, S. aureus synthesizes two major nonhydroxamate siderophores (staphyloferrin A and staphyloferrin B ,), as well as proteins that mediate the import and utilization of iron bound to heme or transferrin . Although heme was identified as a preferred iron source for S. aureus, we found that genes for neither the iron surface determinant (isd) nor the heme transport system (hts) were significantly upregulated in endocardial vegetations (with the exception of isdD compared with exponential phase cultures). By contrast, the staphyloferrin B synthesis operon (sbnA to sbnI) was preferentially upregulated in vivo. There was also a trend towards higher expression in vivo of the fhuCBG operon encoding an ABC transporter for iron(III)-hydroxamates . However, fhuD1 and fhuD2, encoding iron(III)-hydroxamate-binding lipoproteins, were not upregulated in endocarditis (not shown). The observed differences in iron uptake systems may in part be attributable to different experimental conditions and the animal models employed (for example ). Dale et al. constructed a Newman mutant (ΔsbnE) deficient in staphyloferrin B synthesis, and introduction of sbnE on a plasmid complemented the inability of the mutant to produce the siderophore under iron-limiting conditions. The Newman ΔsbnE mutant was compromised in the S. aureus renal abscess model . This mutant was attenuated in the endocarditis model because rats inoculated with the mutant showed lower bacteremia levels, reduced weight loss, and increased survival compared with animals challenged with the parental strain. Although the reduction in virulence was modest, this can likely be attributed to the multitude of virulence factors involved in the pathogenesis of staphylococcal endocarditis. Thus, staphyloferrin B appears to promote staphylococcal virulence in abscesses and endocarditis. Genes encoding multiple transporters were highly expressed in endocardial vegetations, including amino acid permeases, the lantibiotic transporter proteins EpiEFG, a maltose transporter, a potassium ATPase, the norD-opp1 operon, and genes associated with drug resistance, such as tet38 and norB. NorB promoted bacterial survival in a subcutaneous abscess model , and has broad substrate specificity. Upregulation of norB under conditions of low pH or reduced aeration has been reported . Similarly, the efflux pump transporter NorD is iron-regulated and highly expressed in staphylococcal abscesses . NorD is part of an operon with five upstream oligopeptide permease genes (opp1ABCDF), and all were significantly upregulated in endocardial vegetations. NorB and NorD efflux pumps may eliminate toxic metabolites or antibacterial factors produced by the host in vivo, although their substrates remain to be defined. Among the surface molecules with higher expression in endocardial vegetations were the LPXTG-containing protein SasF, and the β-neurexin-binding protein SdrC. Genes within the sdr region (sdrCDE) have been reported to be differentially transcribed , and sdr genes other than sdrC were not upregulated in endocardial vegetations. SdrC could mediate initial contact with host cells or cell adhesion molecules, such as β-neurexin , although our experimental endocarditis data indicate that it was not critical for the establishment of endocarditis. SdrC may play a role in complications of infectious endocarditis, such as metastatic seeding to neuronal tissues. The largest group of genes differentially expressed in vivo were involved in amino acid transport and metabolism. The chromosomal arginine deiminase pathway (arcABCD) was strongly upregulated in endocardial vegetations. Arginine metabolism may serve to counter acidification or as an energy source under anaerobic conditions . The latter is supported by the fact that nitrate reductase (NirBD) and pyruvate formate lyase (PflAB ) were also upregulated in endocardial vegetations. Expression of the superoxide dismutase gene sodA, which is induced under microaerophilic conditions , was reduced in endocardial vegetations. Although staphylococcal vegetations grow in the oxygen-rich bloodstream at the aortic valve, the microenvironment within the vegetation may be oxygen-starved. Of note, we also observed differential gene expression of several gene clusters with yet unknown function (for example, upregulation of SACOL2477 to SACOL2479 and downregulation of SACOL0157 to SACOL0160 in endocardial vegetations). Their role in staphylococcal infections and contribution to the pathogenesis of endocarditis in particular remains to be determined. S. aureus gene expression is controlled by a complex network of regulatory proteins. In a previous study, expression of S. aureus agr in rabbit endocardial vegetations was shown to increase over time and to correlate with bacterial densities in vegetations . We observed that the agr operon was only consistently upregulated in endocardial vegetations, compared to cultures harvested from the logarithmic growth phase, in diabetic rats. The S. aureus fur regulator, which represses genes involved in iron acquisition, cytolysins, and immunomodulatory proteins , also had lower expression in endocardial vegetations than in vitro, as did the transcriptional regulator sarS. Differential expression of other regulatory genes included downregulation of vraSR (involved in resistance to cell wall active antibiotics and antimicrobial peptides ) and the araC family regulator (linking environmental chemical signals and virulence factors ), and upregulation of the gluconate repressor operon gntR. The saeS gene was significantly downregulated in vivo in the vegetations of diabetic rats. With regard to genes differentially expressed in endocardial vegetations from diabetic and nondiabetic rats, we found 61 genes with higher expression levels in vegetations from diabetic animals. Although bacterial densities in the vegetations from both groups were similar (not shown), vegetations from diabetic animals were significantly larger and contained more bacteria than their nondiabetic counterparts. The composition or size of these vegetations may have an influence on staphylococcal gene expression in endocarditis. Of note, several of the differentially expressed genes with high upregulation (argG, argH, glyS, ureC) were previously reported to be upregulated in biofilms versus planktonic cultures . Other genes found to be upregulated in diabetic vegetations (gapA, hemX, nrdF) were demonstrated to be under the control of glucose and CcpA . In summary, we cannot exclude that differences in gene expression observed between diabetic and nondiabetic rats with endocarditis reflect differences in the size of the vegetations involved (possibly attributable to an altered innate immune response in diabetic hosts). However, there is also evidence that S. aureus may sense (and possibly benefit from) increased glucose levels in hosts with diabetes mellitus. We have demonstrated that diabetes mellitus leads to higher bacterial burdens in an experimental model of S. aureus endocarditis. Gene expression patterns in endocardial vegetations differed from those observed during in vitro growth, with overall downregulation of transcription. Endocarditis promoted higher expression of genes encoding toxins, surface proteins, and enzymes involved in capsule biosynthesis, iron homeostasis, and glucose and amino acid metabolism. Our findings indicate that gene expression of the staphyloferrin B operon is upregulated in endocarditis, and that production of this siderophore promoted staphylococcal virulence in this infection model. These results may form a basis for future analyses of specific genes, regulators, and pathways that are critical in endocarditis and other infections. Our findings may thus contribute to a better understanding of S. aureus pathogenesis in vivo and lead to alternative approaches in prevention or treatment of staphylococcal endocarditis. FH and JCL designed the experiments; CR and PMD designed microarray experiments. All animal experiments were performed by FH and JCL; RNA isolation and quantitative PCR experiments were performed by FH; CR and PMD performed and analyzed the microarray experiments. All other data were analyzed by FH, BS and JCL. FH and JCL wrote the manuscript, and BS critically reviewed it. All authors read and approved the final manuscript. This work was supported by the German Academy of Sciences Leopoldina (grant numbers BMBF-LPD 9901/8-157 and LPDR 2009-2 to FH) and by the National Institutes of Health (grant numbers R01 AI29040 and R01 AI088754 to JCL). The content is solely the responsibility of the authors and does not necessarily represent the official views of the National Institute of Allergy and Infectious Diseases or the National Institutes of Health. Support was also provided by University of Rochester research funds (PMD). The funders had no role in the study design, data collection and analysis, decision to publish, or preparation of the manuscript. We thank Irina Fink for excellent technical assistance. The authors gratefully acknowledge Drs Timothy Foster and David Heinrichs for providing the S. aureus sdrCDE and sbnE mutants, respectively.